NGC 6751, also known as the Glowing Eye Nebula, is a classic planetary nebula located in the constellation Aquila, the eagle. It is approximately 6,500 light years distant and has been estimated to span about 8 tenths of a light year in diameter. The nebula was created several thousands of years ago when the aging central star began running out of its nuclear fuel. 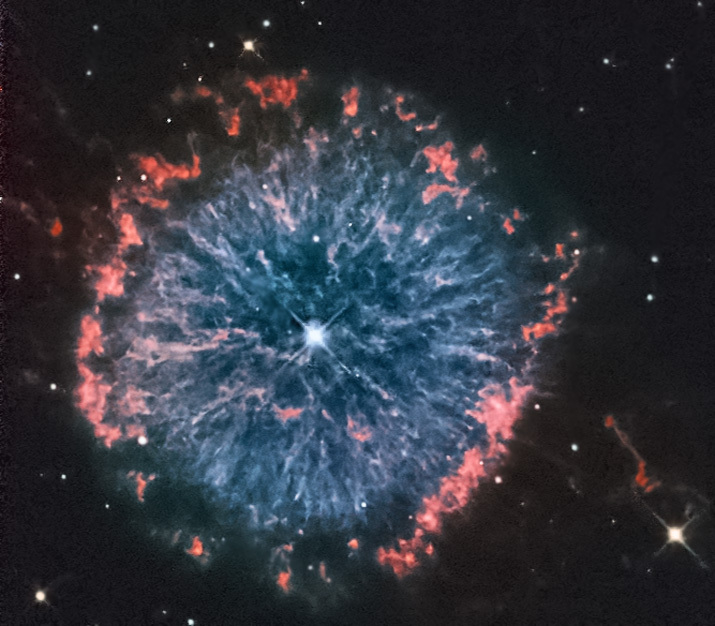 In the star’s dying convulsions, its outer layers were expelled creating the nebula displayed in this image. The collapsed core of the star remains as a white dwarf with an estimated surface temperature of 140,000 K.
The image above was assembled using data from the Hubble Legacy Archive. Two sets of narrowband filtered images and one set of wideband filtered images were used to assemble this near true color RGB image. This image was selelected as the NASA Astronomy Picture of the Day for March 13, 2013. A bi-color narrowband version of the image may be viewed here. 2Based on observations made with the NASA/ESA Hubble Space Telescope, and obtained from the Hubble Legacy Archive, which is a collaboration between the Space Telescope Science Institute (STScI/NASA), the Space Telescope European Coordinating Facility (ST-ECF/ESA) and the Canadian Astronomy Data Centre (CADC/NRC/CSA).